Quick tutorial shows how to install the latest qBitTorrent client in Ubuntu 14.04 and keep it up-to-date while the default Ubuntu repositories provide an old version. qBitTorrent is a free cross-platform BitTorrent client written in C++ and Qt. Its optional search engine is written in the Python programming language. It aims to provide a Free Software alternative to µtorrent. While Ubuntu universe repositories provide the 3.1.8 release for Ubuntu 14.04 LTS, the latest qBitTorrent release has reached version 3.1.11. For the latest features, fixes and other changes see its news page. Type in user password when it asks and hit Enter to continue. Ubuntu 14.04, Ubuntu 12.04, Ubuntu 14.10, Ubuntu 15.04, Linux Mint 13/17 are supported so far. 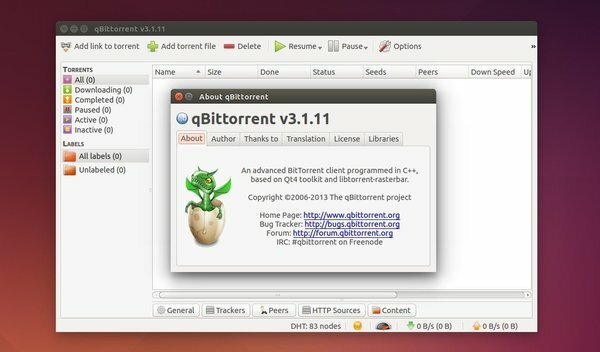 I noticed several configuration details, is qbittorrent already optimized to work with Ubuntu?